Yeehah! 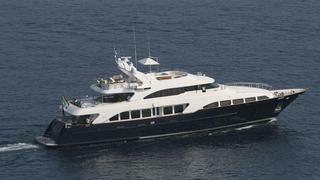 Here's the 100th sale so far this year as Luciano Sagramoni at UFAN Yacht Brokers tells me that his joint listing with Fraser Yachts, the 35m motor yacht Blu, is sold with Miles Clark at Seanergy bringing the buyer. A Benetti Classic 115, Blu was built to ABS class in 2005 to a design by Stefano Righini and had a major refit in winter 2009/2010. With only two owners since new, she offers accommodation for 10 guests in a main deck master suite, two VIP staterooms and two twin guest cabins. Two 1350hp MTU engines give her a range of 3,200 nautical miles. Blu was asking €5.95 million.